I am a new user of pro-e. I want to know how to export a geometry that i created as a .stl file. I tried 'send to' option and clicked 'ok' to export, but I don't know where has it gone. I want to email that .stl geometry. Please help me with step-by-step answer. STL files are commonly confused as Windows Certificate files, and thus stripped out of emails. The best way to get your STL files sent is to first compress them into a ZIP file and then send. You will also see that the STL files compress very nicely and you will not need to send such large files. Hello Sir Lewis, thank you for the reply, but could you also please tell me how to do it in pro-e creo-2 , because i need a .stl ASCII file for my simulation purpose. Saving the file doesn't seem to help. I want to be sure that the file is saved as .stl ASCII, that option was there when i tried 'send to' option ,and when I later clicked 'ok' to export it I don't what happened there, I mean might it have got saved at some place. Because i was expecting it to ask me to specify locations to export it to, or something like that. By default your STL files are created in the working directory. If you are using Workspaces then they will go there by default. You will first need to create the .stl file by using the Save-As command. Set the File type to Stereolithography (.STL) and pick the location you want to save it to on the left. Then from Window Explorer make the .zip compression file of the STL files that you saved to your computer. I will try that, but there was no 'save as' option, only 'save' option was there and the save option did not give options to save it as .stl or .obj , only .prt was there. any suggestions sir? 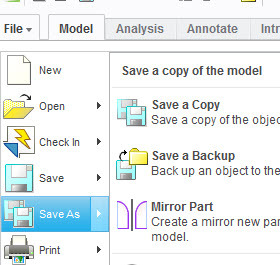 If you don't have Save-As as shown here, then you must have the Educational version of Creo. I believe that version will not let you save as other file types.